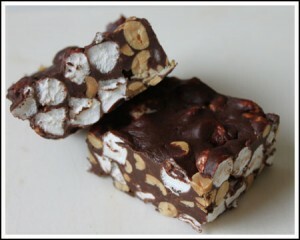 Rocky Road Candy made with condensed milk, chocolate chips and marshmallows. Line a 9x13 inch baking pan with non-stick foil. Combine butter, chocolate chips and sweetened condensed milk in a large saucepan and melt over medium low heat. Meanwhile, combine peanuts and marshmallows in large bowl. Stir in chocolate mixture. Spread in prepared pan. Chill 2 hours or until firm. Remove from pan by lifting edges of foil. Peel off the foil and cut into squares.